UPDATE: Much progress was made after this post. Read about it here. 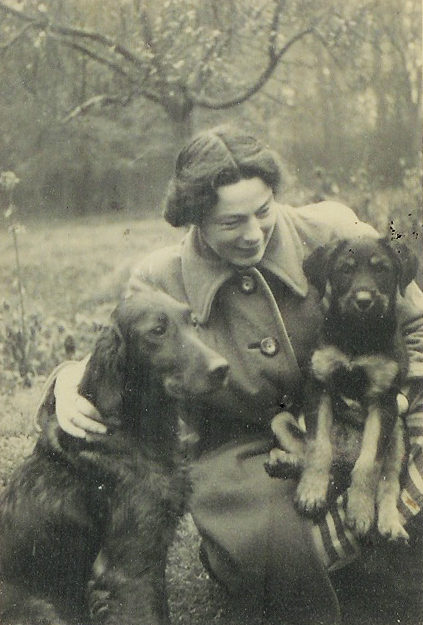 Louise “Loes” Kool (n. Lopes-Cardozo) with her dogs. Our family has a rich history of dog lovers. Funny story, but when I first started looking into this tale of a sea captain saving the king of England, I was looking at notes scratched onto a sheet of paper by my mom a year ago or so and it seemed like she was trying to say the king had Labrador dogs, not that he had the land in Canada. In looking into my family history, there’s a tale of a Dutch sea captain in the Lopes-Cardozo — possibly van Ameringen, etc. — line who saved a King of England from drowning. As a reward, the king, who owned Labrador, granted this ancestor land in the Labrador/Newfoundland area. Once a Dutch sea captain, always a Dutch sea captain, though, because my ancestor never took him up on the offer. When my great-grandmother Louise Lopes-Cardozo (who died just around when I was born) looked into it after moving to Canada following WWII, she traveled to the East Coast for a hearing, but the land had already been given away/reallocated and her claim was denied. I’m working on tracking down some of the details, since all of this has reached me second-hand. I reached out to my great uncle and an elderly cousin, but they didn’t seem to know anything more. I also put the question out there on the British history sub-Reddit discussion board to see if anyone had any thoughts as to who the king could have been. William IV – He was in the navy during the Napoleonic wars. George V – He was also in the navy during the Napoleonic wars. Now, one respondent did point out that this could be taking the long way to finding the answer to my who, what, when, where questions, and that possibly I should be looking for individuals in my own ancestry, which is a good point. I do recall a couple years ago seeing “sea captain” noted on the digital record of a wedding or a birth when I was first compiling my family history. And it was when I went down the Lopes-Cardozo rabbit hole. However, I don’t remember whose name I saw that next to, and I also feel like there’s probably more than one. I’d love to hear other theories, recollections, or suggestions.